Did you know plyometric exercises (like this box jump) can help to improve run performance? Plyometrics are quick, powerful movements that help to maximize muscle recruitment, increase force production, and decrease ground contact. This all translates to better running economy, and we all know that means improved performance! ➡Build a solid foundation of strength and stability first. 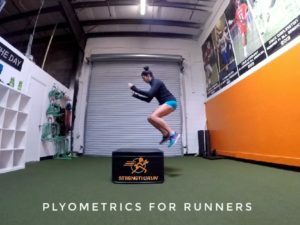 Because plyometrics are explosive and require a quick and forceful recruitment of muscle fibers, they are the final building block of a successful strength and conditioning program. Implementing them should occur only after a base of strength and stability have first been built. ➡Form is key!!! It’s not about jumping on the highest box as many times as possible. Proper mechanics not only allow you to perform the exercise efficiently, maximizing your results, but also helps prevent injury! ➡Progressions are uber important. Along with form comes proper progressions. Before ever using a box, hurdle or added weight, be sure to master how to load, jump and land using your own body weight on the ground with simple bilateral movements FIRST. ➡It’s all about timing. As mentioned above, you’ll want to build a solid base of strength before incorporating plyos into your regimen. An ideal time frame for this progressive training period is during your off season and again during early to mid training cycle. Once you get closer to peak, then competition, you’ll want to pull back and focus your strength and power gains in your key runs (hills, intervals and tempo). ➡Timing further explained. Because of the high intensity and high impact of these type exercises, you’ll want to time them up with your key run workouts to avoid over training. And just like with running, after a particularly intense training sesh, you’ll want to approach the next workout or two as recovery.